One of the reasons why I love paper crafting and card making so much is that little thrill that you get when you open up your mailbox, peek inside and find a little envelope addressed to you with a handmade card. I love sharing that feeling with others (although I do admit that I'm not always on top of my game when it comes to mailing cards out!) and I especially love when it happens to me! I wanted to share a card that I got in the mail the other day for my birthday, which is today! This is from none other than Mary Fish, my up-line and fearless leader! I love her to pieces! What a cute card! Check out her original post here. Want to know something silly? I originally fell in love with Mary when I first noticed that she changes the color to her header on her blog every now and then, to go along with the current holiday or fresh new color. I love how something so simple can be so cheery and make such a difference! Not sure if you ever noticed it, but I'm sure you will now! Haha! Happy Birthday Nina! 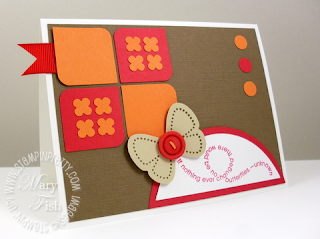 Mary's card is gorgeous! She is a great person and leader! Have a wonderful day!